Startng on the back nine on the 6276 yard par 69, the Rathmore man birdied the 10th, 11th, 14th and 16th before making an eagle two at the 283 yard 17th and a birdie there the 18th to turn in seven under 27. He was nine under when he birdied the first and third and need only on more birdie and five pars for a 59. Instead, he made a double bogey five at the fourth, birdied the seventh but then took six at the par-five ninth. “I played great,” Dunbar told the Europro Tour website. “I got off to a good start with two good swings on ten to get a birdie there. I played really well and putted well. “On the 17th, a par four, I hit it to about five feet from the tee and that eagle got me to six under so I got the 59 into my head then. I made a few more birdies after that but then I had a terrible double-bogey on the fourth, a par three. “I bounced back well to par the next two and then make a birdie but I had a disappointing finish bogeying the last. Dunbar leads by two strokes from Gary King, Billy Hemstock, former Ryder Cup player Phillip Price and James Frazer but it was a very mixed day for the rest of the Irish. Richard Kilpatrick and Mark Murphy are tied 13th after three under 66s with Simon Ward tied 46th after a level par 69 and Stephen Grant tied 62nd after a 70. However, Tim Rice (73), Richard Weldon (75) and Headfort's Brian Casey (80) have a mountain to climb to make the cut. Alan Dunbar hit a second successive 69 to lead the Irish bid to come through the First Stage of the European Tour Qualifying School at Section A venue The Roxburghe. Richard Kilpatrick opened with a super 66 on the Alps Tour. 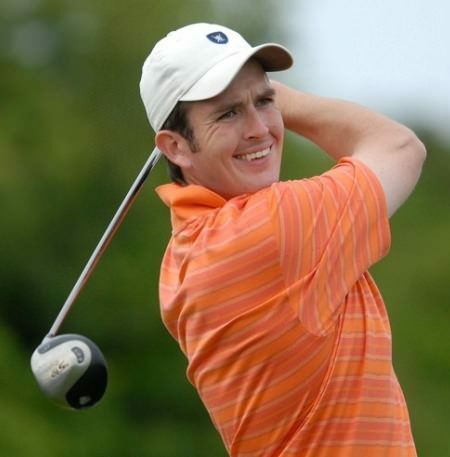 Banbridge’s Richard Kilpatrick has endured a tough start to 2013 but his cares faded away as a sensational five under 66 left him just a shot off the lead in the Open International de la Mirabelle D’Or on the Alps Tour. Leona Maguire rules out rush to pro ranks and Olympics (for now): "I'm definitely not going to do anything rash"